On April 22nd, 2013, can you believe we will celebrate our forty-third Earth Day? Let’s see now, it’s the year 2013 so according to that calendar year we let the earth go for thousands, I mean millenniums of years and NOW we’ve decided to take good care of our sweet blue planet. Our earth, this global home has been a bit overlooked, taken for granted, trashed, over-populated, polluted, and mismanaged. It’s heartening to know that we are now a bit shocked and worried about this lovely spinning ball and we are thinking of ways to clean up the place. More of us are recycling, driving more efficient vehicles, paying attention to chemicals in products, buying local, but what else can we do besides using cloth bags at the grocery store? Plant trees, use natural objects for arts and crafts, do some research on our giant home, recycle, reuse, clean out your barns, homes, garages and donate to good will so that others can use what you don’t need, clean up the roadways of litter, talk about Earth Day and ways to celebrate with your friends and family, ride your bike or walk, and enjoy this season. The Sterling Nature Center would be a great place to visit and enjoy the beauty of our earth, with 1400 acres with 2 miles of Lake Ontario shore and 5 miles of Hiking Trails. The Center has: a diversity of habitats; public programs; picnic shelter; observation decks; exhibits; gift shop; and a canoe launch into Sterling Creek. Open dawn to dusk (every day of the year). Sterling Nature Center, which is located in northern Cayuga County has two programs lined up to commemorate this sacred event: Pizza & Petals and Trail Work Day. Check them both out or just attend one! 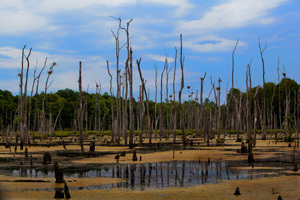 The nature center offers some amazing birding at their rookery with multiple nests for the Great Blue Heron. 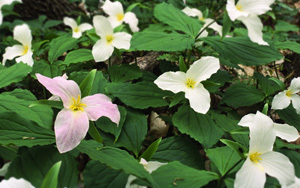 Celebrate Earth Day early with Nature’s spring beauties, trillium, hepatica and other woodland wildflowers. At 1pm naturalist and Sterling Nature Center Director Jim D’Angelo will led a walk along the trails of the nature center for a look at some of nature’s beautiful woodland wildflowers. Identification, natural history and interesting facts about the spring woodland wildflowers will be discussed on this walk. As a special treat before the walk homemade pizza and Ontario Orchards’ apple cider will be available from noon to 1pm. If you would like to join us for pizza please let us know so we can provide enough for everyone, contact the nature center at 315-947-6143 or snc@co.cayuga.ny.us. You do not have to partake in the pizza to join us for the wildflower walk. There is no fee for this program, but donations will be accepted and greatly appreciated. The Sterling Nature Center is located at the end of Jensvold Rd in northern Cayuga County in the town of Sterling just up the road from the Sterling Renaissance Festival grounds. The Sterling Nature Center is looking for some volunteers from the community to help with a few large projects like building bridges on the Wetland Loop or Two Tail Trails as well as help spreading woodchips on the Heron Trail. We are seeking groups or individuals that would be interested in supplying much needed labor and a few individuals to be crew leaders for each project. Please contact Jim D’Angelo at 315-947-6143 or snc@co.cayuga.ny.us if you or your group is interested in lending a helping hand.